Cabbage plants grow in a rosette near the ground or on a short stalk. As the plant grows, the leaves increase in number, forming a ball-shaped "head" in the center of the plant. 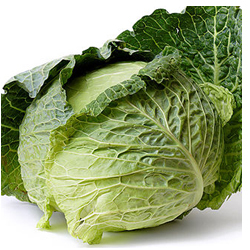 Head cabbage and head lettuce are similar in appearance, but cabbage leaves are usually more tightly wrapped on the head. Plant soon enough that it will mature befor the heat of summer.